This tutorial will review the integration of the Zopim live chat service on your PrestaShop 1.6 website. This is an important aspect for an online store, as using a chat service will allow you to interact with visitors. They will be able to ask questions about your product, which can convert them easily into paying customers. The first step of the process is to get your Zopim Live Chat addon. 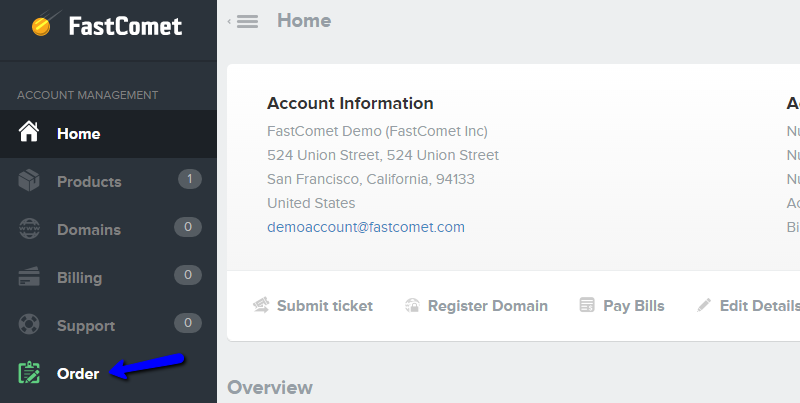 FastComet is an official Zopim reseller and we offer a free account and integration of the chat with each of our SSD PrestaShop Hosting plans. If you are an existing client, you can order the addon via your Client Area. Simply navigate to the Order section to proceed. Select the Product Addons option from the main navigation menu on the page. This will list all available addons for your plan. Scroll down to the Zopim Live Chat addon and click on the Add to cart button to order the service. Complete the new order for the Zopim Live chat. You will receive a confirmation email within a few minutes, which contains a direct link to your Zopim account and the details you need to use for it. The second step is to integrate the Zopim Live Chat widget with your PrestaShop 1.6 website. You can achieve that with the use of the official Zopim Live Chat module. You will first have to download the module on your local computer. It is an archive package that you can easily install through the administrative area of your PrestaShop website. You can follow our tutorial on how to install modules in PrestaShop 1.6 for more information on how to complete that. Once you install the Zopim live chat module, you can access the Modules manager again. In the Modules List section, type in “Zopim” in the search box. Click on the Configure button next to it. Enter your Zopim widget ID number in the available field. Note that the ID can be found within your Zopim account. You can navigate to the Widget tab on the navigation menu and locate the Zopim Live Chat script. Once you locate your Zopim ID, enter it in the chat module on our website. Click on the Save button to keep the changes and access your store’s front end. The chat widget will be displayed at the bottom of the page. Enjoy!